NetSuite is an integrated application which manages the wholesale and distribution business. 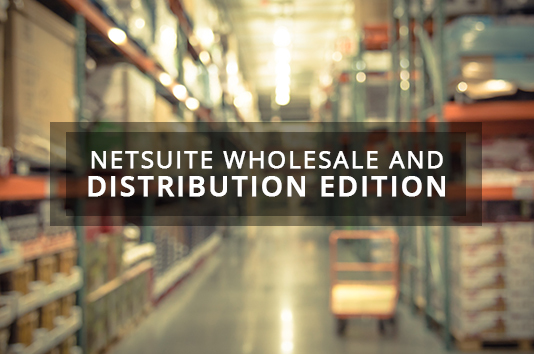 With the help of NetSuite Wholesale and Distribution edition will give the companies automation. It helps the services to be linked seamlessly with back-office. With the help of this software, one can grow your wholesale distribution business and provides new services by increasing customer service levels and cuts the cost throughout. The normal tender of the distributors is to juggle the different business applications and manage the numerous spreadsheets for managing the complex industry. Now, you can stop wasting precious resources managing the “silo” systems. It is an application which is intelligent, integrated, and customizable that unifies all the business processes which helps in increasing the visibility for better decision making and extending the processes to customers as well as channel partners. With role-based dashboards, this NetSuite edition will give every user of the company a custom dashboard which will allow them to monitor everything related to their business. It’s like having information at your fingertips. A dream turned into reality. You can manage it all with just a drag-and-drop layout. Most of the distribution companies have countless hours of work which are associated with data entry, organization, and fulfillment. This will help in converting leads to orders and orders to shipments and shipments to revenue. NetSuite also helps in the warehouse processes. The integration of UPS or FedEx will simply allow you to transmit the order information directly to the UPS or FedEx and instantly receive back the rate, track the number, verify the address and print the shipping labels which are shared by the different individuals, teams and customers. The accuracy can be improved by the profitability by associating the item costs which are related expenses for calculating the complete landed costs factorizing in expenses such as shipping or duty. This application helps in shifting from manual, paper-based purchasing to lower cost, higher control automated purchasing. NetSuite helps in streamlining the purchasing saving the money that will go straight to the bottom line. The CRM software helps in increasing the service levels and generates a growth in the distribution company. In a recent survey by one of the top analyst firms ranked NetSuite CRM software as No. 1 in Sales Management, forecasting, opportunity management and dashboards. Distinct to the standalone CRM applications, NetSuite CRM is a software which will seamlessly integrate financials with the back office systems by giving you a 360-degree view of the customer. With NetSuite, you can manage the complex back office within one system. You can automate and have a paperless system which will be benefited in the future. The quality of services and the support provided are critical for the distribution companies. They are both are required early on during the delivery process and over the time for customer satisfaction and retention. The higher levels of service can be costly and for this very reason, NetSuite provides you tools which provide the right level of service to the right customer at the best cost. A website is like the channel of choice for the customer as they are the interacting with them. NetSuite is the only application provider which includes the website hosting and e-commerce as their core components of their application. Its e-commerce functionality will let you leverage the web for growing your business faster and be more cost effective. One's company can also deliver an intuitive and stream lined experience for both the customers as well as the partners. NetSuite’s NetFlex customization and extension technology is a platform which helps in growing the distribution business with a flexible, powerful and extensible business management solution. This application will help in empowering your channel partner as an extension of your sales organization which will make it easy for them to sell as your internal reps.
We at Inspirria Cloudtech, are here to help you. You can take us as your secured cloud provider partner and NetSuite solutions with a decade plus of experience working with 500+ Cloud projects. We push productivity to its optimum level with some proven solutions that are used by best companies all over the world.